mad orange fools: Like sherbet. I think I mentioned before that my snapdragons are amazing this year. I am so in love with them. And this photo right here is one of my favorite spots of the yard right now. 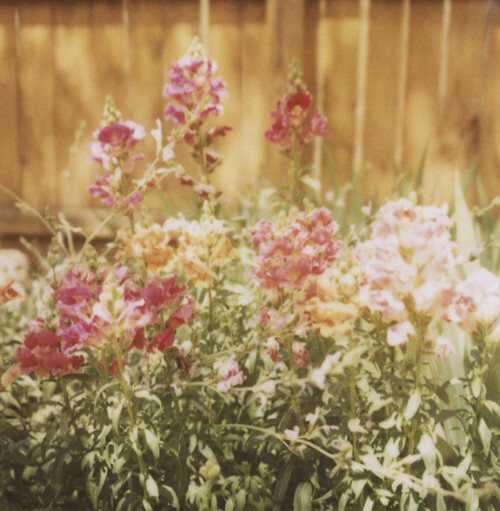 The snapdragons are so tall and bushy and, while it's not visible in this not so in focus pola, the purple sage blooms are reaching out between the snapdragons and the colors are wonderful. Like sherbet. And that's what makes me love zinnias later in the summer. All the different colors. My seeds are struggling this year though and I can't figure out why. I don't know if I covered them with too much dirt or if they washed out or what. It's kind of bumming me out because zinnias in the late summer are my favorite. I may plant some more seeds. It's getting a bit late, but since zinnias are late bloomers anyway, I think it will be okay. The weather has been quite nice lately. Sunny and warm during the day, a little bit cool at night. Just like June should be here in Santa Fe. That week or so of 90 and 100 degree was just too much heat way too soon. I'm glad we got a little reprieve from it. Yesterday was a lovely day and we ended up having an impromptu cook out in the backyard. Will made some excellent margaritas, then moved on to the grill. He cut up a baguette, brushed it with olive oil and garlic and grilled it. So good. It was super hard to stop eating it. We also had grilled shrimp (always so good) and lots of grilled vegetables. The perfect almost summer meal with friends in the backyard. Will also installed a couple of ceiling fans in our house over the weekend. My office gets incredibly stuffy during the summer because I don't open the window. I know, it sounds dumb, but it is so so dusty here that I am paranoid about having the window open and getting dust in and all over my computer and cameras. The ceiling fan makes a huge difference and it looks pretty damn good too. A bit modern for our old house, but that's okay. I love it. We also put one in the bedroom to get more air circulating in there. That week of oppressively hot weather was rough so we're hoping the ceiling fan helps when the heat returns. I'm so incredibly lucky to have such a skilled (and talented) husband. He can do just about anything. So things are good. I am super busy. Barely a spare moment between household chores, my handmade work, the garden and trying to be a little social too. Sometimes I have so many little things to do, I get totally distracted and start one thing then find myself wandering off to the next thing without actually finishing the first thing. My brain is all over the place lately. In a good way, for the most part. The one thing I am not doing so well with is spending at least one day a week not doing my regular week. We need to get out and hike and explore and not be in the house. Soon. Well, I best stop this rambling because I am probably supposed to be doing something else right now but I started this and forgot about it!